Welcome to Monday again! Hope all of you had a great weekend and everyone can have a great start for this week. Kids' school hours are now back to normal until 2PM after the mid-test last week. Bento is back to normal lunch size. I made a puppy from rice and decorated it with nori, jelly ball, and inari skin. Inside the box : steamed rice, bean sprouts & spring onion stir fry, cherry tomatoes, fish & cucumbers in yellow spices, and carrots. I hope the fish will not be too spicy, I used sweet chili so kids can still eat it. My girl has no problem with spicy foods now, but my boy is still adjusting from the mild level. Soon, I can put more spicy foods in their bento. The Bento4Japan auctions on eBay are still going on. Please support and check it out if you have time. 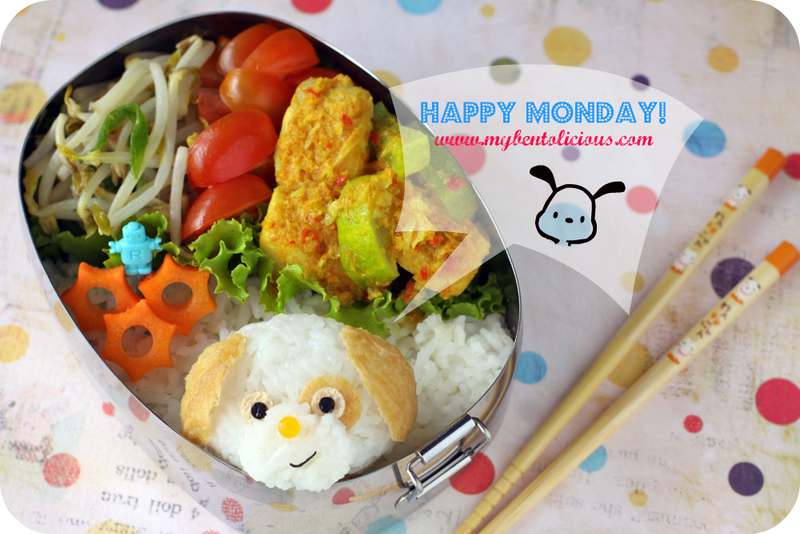 What a cute dog peeking from the bento! Too cute! I love the carrots of all things. lol. Yummy stir fry combo.. Loved the puppy! I am a dog-person and I tell it to everyone :). Nice to hear the kids liked the fish! Cute cute cute! Puppy has a sweet and eager face that remids us to start the week with joy. Beautiful bento, Lia! I love all your Bento creations! U are such a wonderful mother. If only i'm half as wonderful as you. Your children are absolutely lucky to have you as their mommy. The doggie in this bento is sooo adorable. I like how the mouth senget to one side.. almost like smirking! Oh Lia your bentos always make me smile! I love the puppy, he's so cute! hi erm i live were there are NO japanese shops and im terrible on the computer,iv always wanted to make my boyfriend a bento,iv even gone and bought him a bento box and myself a cook book for bentos but i dont know where to get all the cute tools from or even how to find them online,could you please help me with a few websites please? @Natalie : You can try some of the online shops to buy your bento tools : Bento&co, J-Mama, Bento Craft, J-List, From Japan With Love. Hope this can help!